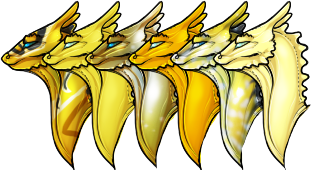 Information on colors, growth, and other topics regarding dragons and whers can be found here! NOTE: Traditionalists tend to frown on cross-gender Impression for dragons of any color, although it has long been accepted that whers and fire lizards have no gender preference. All dragons on TPA are capable of flying the entire Fall except in case of injuries and are expected to do so, regardless of their color or size. The largest dragons on Pern, Golds are the ‘queen’ dragons of a Weyr. They are the the broodmothers, incapable of chewing firestone. They are capable of commanding all other dragons, though some younger Golds may get snippy with their seniors. The eldest Gold that still clutches is referred to as the Senior Gold, and she and her rider serve as the Senior Weyrwoman (or Senior Pair). Golds rise one to two times per turn and clutch anywhere from 5 to 20 eggs, depending on the age and health of the individual. An old or stressed Gold may lay less than 10 eggs. Golds traditionally impressed to women although they have Impressed to nonbinary people in recent turns. It is commonly thought that they prefer women who were not raised in a Weyr, though one never knows what a young dragon will pick. The largest male dragons, Bronzes are commonly seen as symbols of leadership. In truth, they come in a myriad of sizes and personalities, and like all dragons, it is unknown what they will grow into. In the past, they used to exclusively hold leadership positions, but with the changing of the times, many have settled into more versatile positions. Bronzes are most commonly the dragons to catch Golds, but they are often challenged by large Browns. Bronzes may command all colors except Golds. Bronzes impress to people of all personality types, no longer exclusively impressing to those who show leadership potential. While bronzes traditionally Impress to male and nonbinary candidates, the first female bronzeriders appeared at Fort Weyr in the winter of 2760 and since then female bronzeriders have become a not-too-unusual sight among the youngest generation of riders. The second largest males, Browns are the workhorse of the Pern airforce. They come in all sizes and colors from a light sandy color to a coppery-red-brown to a deep chocolate color. Browns have shown that they can lead as well as Bronzes, and it has hardly become uncommon for a Brownpair to become Senior Weyrleader, or even Junior Weyrleader. Browns fit into all positions, from Wingleader to Candidate Master, they can be found doing all sorts of jobs and tasks around the Weyr. Browns traditionally Impress to male and nonbinary candidates but have Impressed to women for nearly a century. There are now female brownriders of all ages and they are fairly common. A new mutation, appearing first in firelizards and whers in the winter of 2760 and dragons in the summer of 2761, Garnets are a curious new addition to the heirarchy. They are female, usually fitting right between Blues and Browns in their color range and ability to command others. They were once believed to have a slight affinity for women, but have since proved to Impress to male candidates without difficulty. Curiously, Garnets seem to be able to produce small clutches (only about 25% of the time) despite being fed firestone. They rise between one to three times a Turn. The usual number of eggs is 2-3, but can be as many as 5. For some reason, they cannot hatch Golds or Bronzes, with White and Garnet both being rare. Traditionalists highly disapprove of garnets and their existence remains somewhat controversial. They are a rarer color by virtue of being relatively new and some hope they will eventually fizzle out altogether while others believe they will someday be as common a sight as browns. The smallest males, Blues are agile, quick creatures. They are valuable as scouts, messengers, and Searchdragons. Since Blues are unlikely to catch Golds (though a very young Gold may still be caught by one), they often chase Greens, being faster than their larger cousins. Blues fill many role that the larger dragons cannot, and are often sharing their duties with Greens. It is not uncommon to see Blues leading high flying wings. Blues have long impressed to all genders with no preference although the strictest of traditionalists still believes they ought be ridden only by males. The smallest females, Greens make up 50% of the population of Pern. Due to their size, they are often paired with Blues for many of their tasks. Greens do not often clutch, though they rise anywhere from one to four times per turn, and are capable of chewing firestone. If they do not, they can have 1-3 eggs. Because of their size, they are often caught by Blues, being too fast for the larger Bronzes and Browns to catch. It is not uncommon to see Greens in leadership positions, especially tending to Weyrlings or leading high flying wings. Greens have Impressed to all genders for as long as anyone can remember although certain traditionalists believe they are best paired with women. The smallest dragons on Pern, Whites have a wide variety of gender expression. They choose their own pronouns; male and female are common, with neutral pronouns being less so. Whites make excellent Searchdragons, their small size making them rather unintimidating to many Holders. They are not often Wingleaders, but they make for excellent Wingseconds for the high-flying wings. Whites do not rise or chase, and have always impressed to all genders. They have existed on Pern for over two centuries now and while some traditionalists still view them with suspicion, they are decidedly more accepted into Pern's draconic ranks than garnets are. 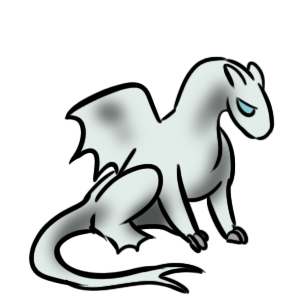 As of late 2767, white dragons have started to appear black or with black markings. Uniques are one-time mutation dragons, whers or firelizards earned through post-ranking prizes only. They can rank anywhere between white and bronze, and are never, under any circumstances, queen stand-ins. Unique females do not clutch. Pern regards many of these creatures with suspicion, and it is commonly believed that Almandine Cabadath is the source of these strange mutations, as it is from his line that Garnets were born and have become more commonplace. Each Unique dragon is its own color, never again repeated on Pern. As such, there are no gender requirements to impress one. Last edited by Jabberwoky on Thu May 24, 2018 6:02 pm, edited 1 time in total. Whers are nocturnal creatures, and are often violent, monstrous beasts. All whers speak in broken, short sentences, giving the impression that they are less intelligent. This is usually not the case. Unlike dragons, Whers can be bonded to a new handler if their original handler has been killed, or is otherwise dead. Bonding to a wher is done by cutting one’s hand and smearing blood on their face, or simply bleeding all over their face. Whers are violent enough to kill their handler if they are being mistreated, are unhappy with their handler, or are simply too violent to handle. Female whers run as often as their draconic counterparts, with clutching rates being similar. Wherhandlers may bond to up to two whers. You may only apply a wherhandler with one wher, and the second will have to be bonded in-play. Last edited by Jabberwoky on Thu May 24, 2018 6:04 pm, edited 1 time in total. Firelizards are the macaw-sized ancestors of dragons. They are small, miniature relatives of dragons and whers. They live in large groups, usually lead by golds. It is not uncommon to find firelizard eggs on the beaches or in cooking sands. They are good companions for those who have lost dragons or failed to impress. Anyone can impress a firelizard, so long as they shove food into their tiny faces upon hatching. Firelizards can be taught to do tricks, run errands, and send warnings. They are companion pets, and some holders and weyrfolk will breed them. Firelizards, like whers, don't care about the gender of the person they bond to.